The 30-year old Kohli boasts an average of 53.76 in Test cricket, which gets even better when he is the captain – 62.70. In awe of Indian skipper Virat Kohli, head coach Ravi Shastri believes Kohli’s much-talked-about sweep at the International Cricket Council (ICC) awards 2018 was something ‘extraordinarily special’ and it wasn’t likely to be repeated in the future. Kohli became the first player to win the Sir Garfield Sobers Trophy for ICC Men’s Cricketer of the Year, ICC Test Cricketer of the Year as well as ICC Men’s ODI Cricketer of the Year last month. The 30-year-old was also named the captain of both the Test and ODI teams of the year. “Starting with the ICC awards [sweep], I don’t think anyone will ever do it again,” Shastri told Cricbuzz. “It is something very rare because you need two things to happen to win all awards in a single year: You need to be a captain of a very good cricket team across formats, that allows you to win two awards, as the best captain of the ICC Test team and the ICC ODI team. Kohli boasts an average of 53.76 in Test cricket, which gets even better when he is the captain – 62.70. Of his 25 Test hundreds, 18 have come with him at the helm. 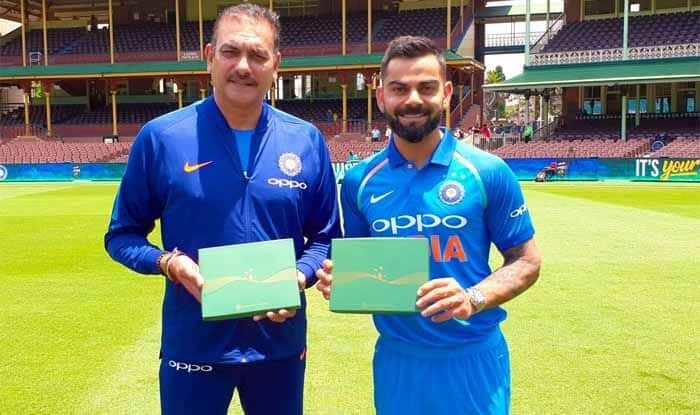 Shastri heaped praise on Kohli’s ability to thrive as a leader and believes he is cut from the same cloth as greats like Sir Vivian Richards and Imran Khan. “To carry that kind of pressure of captaincy and clean up all the individual ICC awards as well is phenomenal,” he said. “We have had great players who struggled to handle pressure when they were captain. Then we had some captains who didn’t know what number to bat at – when they are good enough to go at No.3, but they chose to go at six or seven. The 56-year old also compared Kohli dominance in world cricket to legendary Sir Vivian Richards and Imran Khan. “But here is a guy who is as dominant as Sir Vivian Richards. The closest I have seen to the great man. Virat is in your face, he wants to dominate and has a work ethic like no one else. Whether it comes to discipline, training, sacrifice or self-denial, it is unbelievable. “I think India is lucky to have a leader of that sort. He reminds me of Imran Khan in many ways – in the way he sets the example and sets the standards, and goes about defining it in his own way and leading from the front. Virat is special, absolutely special, for someone to get runs in dominant fashion in South Africa, in Australia and in England.